Ethically produced meat – naturally reared, premium quality meat with fat is the starting point for creating your own homemade delicious and gourmet sausages. How your meat is reared really does matter for taste. Pigs in particular are intelligent creatures that would naturally inhabit the woodland floor, scavenging in their social groups all day to find enough sustenance for survival and breeding. They lay down fat to keep warm against the cold and need cool damp or watery wallows and shade in hot weather to keep cool. This is sadly not how the vast majority of foreign pork available in the shops/supermarkets is reared. Modern breeds of pig created to grow fast in mainly artificial conditions and to be as lean as possible are used. Sometimes they are kept indoors and without bedding on slatted floors suspended over lagoons of the animals own effluent. They are kept in confined and restricted conditions, often in darkness or artificial light without stimulus for an intelligent animal and without any access to truly ‘natural’ behaviours – it is no wonder they bite each others tails off and become aggressive and stressed! 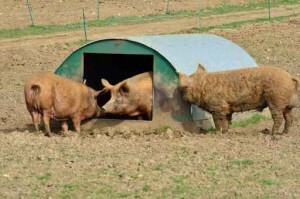 Rare or traditional breed pigs kept as close to ‘naturally’ as possible are very different. 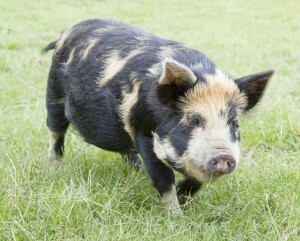 Breeds like the British Saddleback, Gloucester Old Spot, Oxford and Sandy, Large Black, Berkshire and plenty more. Having experienced very little ‘commercially improved breeding’ rare breed pigs cope well in ‘natural’ conditions where they please themselves about being indoors or foraging outdoors in the soil for tasty treats. These traditional breeds are fatter, more bristly and better equipped for a natural life to supply ethically produced meat. There are small-scale specialist breeders all across the country who have passion for their pigs. They will be happy (by appointment!) to show you in person how their pigs for meat are kept but expect this ethically produced meat to be substantially more costly than the lesser alternative but higher quality. There are also small family butchers who deal with local suppliers, farm shops, farmers markets, specialist internet suppliers etc. 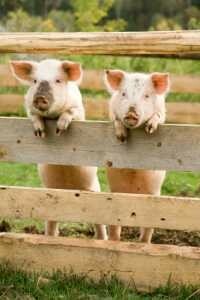 You need to ask searching questions of your meat supplier about what breed the pork is? i.e. traditional old breed or modern high production pink pig? The way that pig has lived and died really matters to taste. Stress at the point of slaughter infects your meat with unnecessary and undesirable stress-induced chemical rushes so degrading the quality that stress free slaughter provides. It’s not just kind to the animal, it’s better for you.